Information on how to order is at the end of this page. The large and small rugs in the files below are currently available, unless a few are marked 'sold.' (The items in the photos illustrating the files below usually are gone; if not, you will find them within the file.) Click the titles to see the selection in each category. Larger rugs are often about 5 x 8 feet, made to fit into the rectangular rooms in Moroccan homes. Some are a bit narrower or wider, and sometimes they are as long as 11 or 12 feet. Click above to see the current selection. These rugs range from about 2 x 4 feet to 3 1/2 x 6 feet and come in various patterns and colors. Click above to see the various colors and styles. I’m adding a special section for these unique items. These are the kind of pieces that rarely come on the market any more; I fear the women who made them are literally a dying breed. 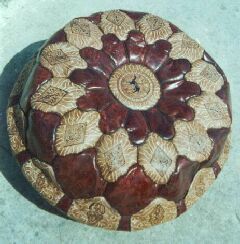 It seems people don’t take, or have, the time to make large pieces like those below. The pieces below can be ordered, the first group from Morocco and the second from the US. Since the following pieces are not in and out of stock, I can order one to be sent to you directly from Morocco. That's because the designs, colors and sizes are relatively standard, unlike most Moroccan rugs. Click above to see what's available this way. Some of you know that I would really like to be dealing more directly with women in Morocco and hope to do so in the future, but right now reaching them in rural areas is difficult. 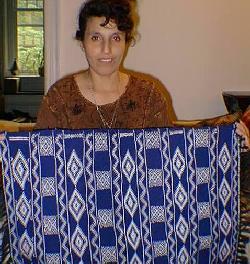 However, I've met a Moroccan weaver who lives in the US, is very skilled, and will weave to order. Click above to see this section for more details. Pillows are a bargain in Moroccan weaving since woven ones offer miniature versions of the rug designs, and have two different faces. The prices are small too, especially the embroidered ones. It's hard to find unique, hand-made items in this price range, and they make great gifts for discerning friends. The woven pillows are like mini-rugs: they usually have one face with a rug-like design and a plainer back with stripes. 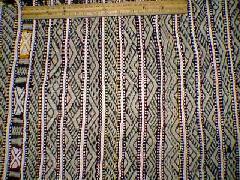 They are handwoven in wool with white cotton designs and most are rectangular, 12"-18" wide and 18"-24" long. Click above to see the variety now available. 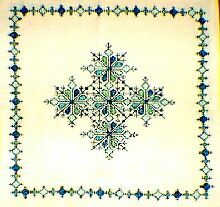 I have several pillows embroidered in the delicate lacy "Fes" style by a Moroccan friend Fatima. 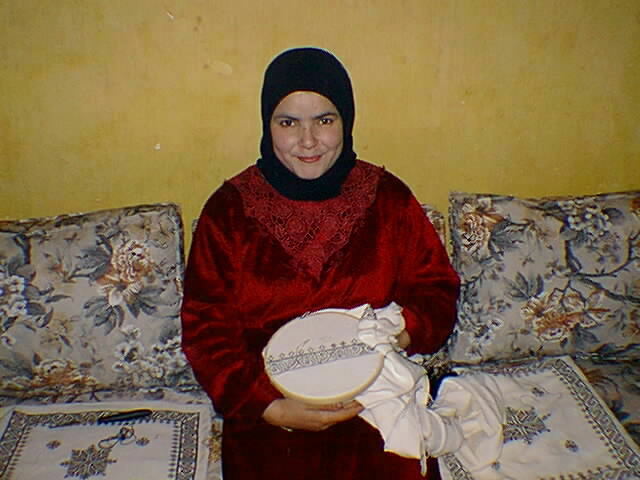 Her family are old friends, and her work is an example of what I'd like to do with artisans: she sells directly to me and thence to you, while in her home town most girls know how to embroider so her sales there are very limited. She decided that if she lowered her prices she might increase the volume, so each pillow is $15-$20. Great for wedding presents! Click above to see other designs and colors of embroidered pillows currently available. 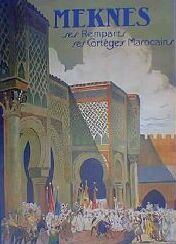 Morocco has a long tradition of fine leatherwork. 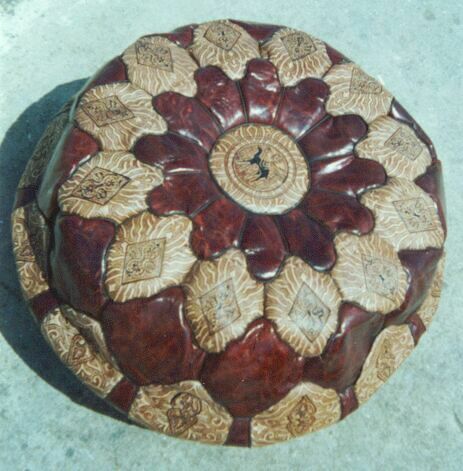 These hassocks, called poufs in Morocco, are one example. While I do not have them in stock in the US, I can order them for you from a friend in Morocco. To see all four available styles, click above. These are smaller items and vary from time to time. They may include silver jewelry like earrings and pendants, slippers, and posters, among other things. It's a good place to look for affordable gifts. 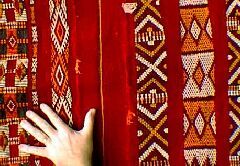 If shopping has piqued your interest and you'd like to see and learn about more examples of Moroccan rugs, click Gallery. Or order first (I don't want you to forget! ), and then browse. You may also want to return to the Introduction. To order something from Marrakesh Express, click here. Please do not send payment until I have assured you that it is available, since sometimes things sell quickly. Because it's difficult to fully appreciate a piece without seeing it and how it fits into your own setting, refunds (less the cost of mailing and handling) are guaranteed for pieces I have here in the US. (I am afraid I cannot do that for pieces ordered directly from the women in Morocco, since they often need the money and spend it immediately, plus the postage to return things is very expensive. Those pieces can only be returned if there is a gross defect, which I usually catch when I photograph.) If you want to order, to have me shop for you for specific items, or have any questions, send me e-mail at sdavis@uslink.net . In fact, I'm curious about how many people look at this information, where they found it, and their reactions; I'd be very grateful if you'd take a moment and drop me a line! Suggestions are welcome. Copyright © Susan S. Davis 1997- 2014. All rights reserved.